Former kidnapped soldier Gilad Shalit met Thursday with 50 Lone Soldier Olim (new immigrants) from across the world. 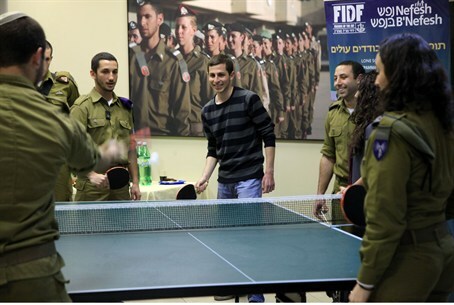 Former kidnapped soldier Gilad Shalit visited the FIDF/Nefesh B’Nefesh Lone Soldiers Program at the Nefesh B’Nefesh offices in Jerusalem on Thursday to meet with 50 Lone Soldier Olim (new immigrants) from across the world. In an informal gathering, Gilad expressed his support and admiration for the brave young men and women who come from countries worldwide to serve in the Israel Defense Forces and defend the Jewish homeland. The new immigrants with whom Gilad met came from countries including the USA, Canada, Australia, Costa Rica, Norway, Mexico, South Africa, France, Argentina, Brazil and Spain and are serving in various units such as Infantry, Intelligence, Paratroopers and Communications, among others. “I admire each one of you for what you are doing for our country. Your decision to leave your families and friends and make Aliyah on your own and join the army is truly courageous and admirable. Although you are far from your own families, you are not alone - we are all one family and are here to support you and make you feel most welcome as Israeli citizens," he said. “We are very excited to have Gilad Shalit with us, and are also very proud to be the home for Lone Soldiers serving in the IDF, taking care of all their needs in Israel and providing them with ongoing support. We thank the IDF for their partnership in this important project,” said Vice Chairman of Nefesh B’Nefesh, Erez Halfon. The FIDF/Nefesh B’Nefesh Lone Soldiers Program, in collaboration with the Jewish Agency for Israel and KKL, assists newly arrived soldiers with their transition into their new lives in Israel and national service, by offering guidance, social and emotional support, quarterly care packages, adoptive families and financial aid, as well as assistance to parents of Lone Soldiers in the form of information and support.